How am I feeding myself on the Cape Wrath Trail in February 2019? In summer I’d buy everything locally, but I’m using a different plan this time. I’d like to clarify that sending gas cartridges and batteries through the post isn’t allowed. I genuinely had no idea this was the case when putting my resupply plan together – unfortunately it slipped through the net! When I first hiked the CWT in summer 2015, my strategy was simple: I stocked up at shops along the way. This works just fine for a summer trip, because you’re never more than a few days away from the nearest shop and you can achieve a fairly predictable daily mileage. However, in winter, certain businesses are closed. Additionally, I won’t be able to achieve the same mileage between village stores along the way, and I’ll require more calories. These factors add up to bigger, heavier food loads – making it all the more important that I’m able to stock up where I need to, and that the food I’ll be carrying is both highly calorific and as light as possible. I’ve only used a resupply box on one Scottish long-distance trip before, in 2016. It’s a handy strategy when you expect to stay at accommodation with no nearby food stores. Figure out where you need to send your stuff. Good places to look for are walker-friendly B&Bs, bunkhouses, hotels, and campsites. Contact the establishment to ask if they will accept a resupply box for you. In many cases, accommodation on established long-distance routes will be used to this and will be only too happy to oblige, although it’s polite to then stay with them as well. I don’t advise sending a box without asking first – not everywhere will be happy to hold a box for you, and many places are closed over the winter anyway (especially campsites). 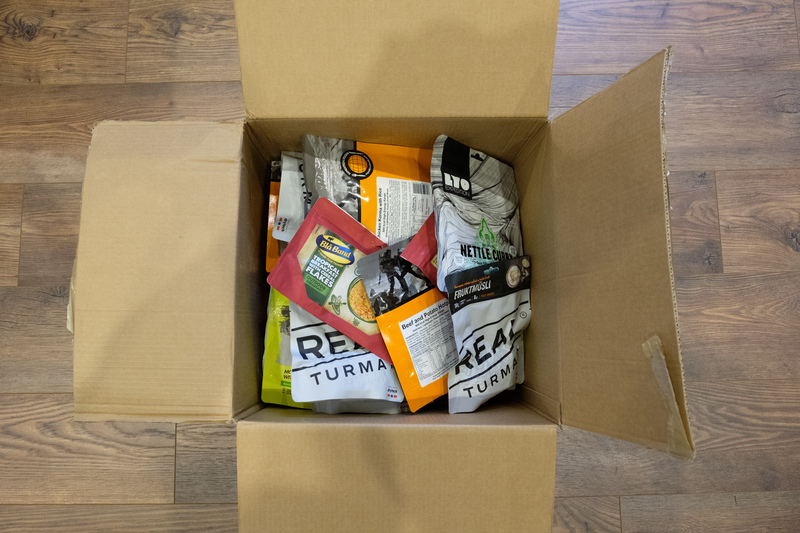 Figure out how much food you need to send in each box. You can also pack toiletries, maps, and other items. Don’t forget to include a luxury or two! 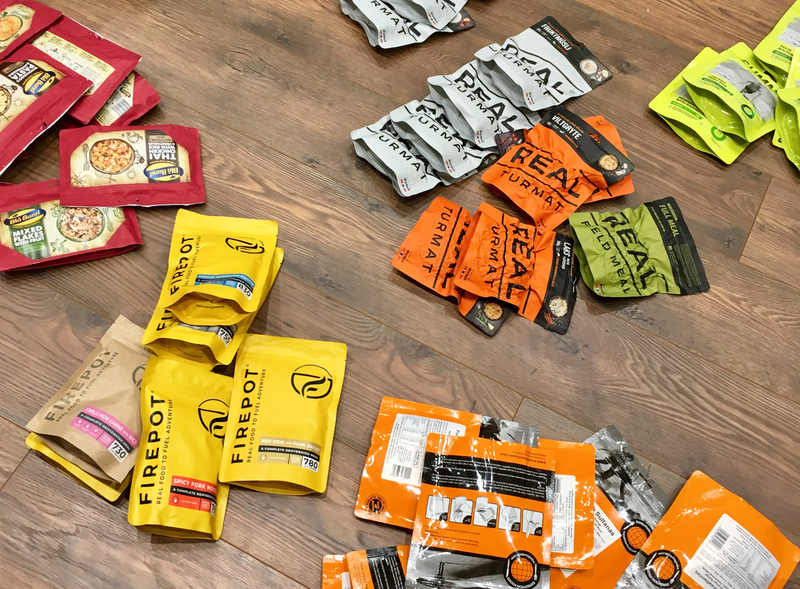 The good folk at Firepot and Base Camp Food sent me a real mix of breakfasts and dinners, so I should have plenty of variety to look forward to. It’ll be interesting to compare and contrast the different brands over the course of such a long trip (for me, anyway). I have supplemented these dehydrated meals with the usual mix of cereal bars, malt loaf, mixed fruit and nut, instant coffee, and hot chocolate. As usual, I will be operating on a slight calorific deficit. It’s how I prefer to hike. I have some spare body fat I can burn, and I’ll be eating inhuman amounts of food at hotels and other stops along the way. Here’s the plan for my winter CWT. Although these establishments were only too happy to take in a box, you shouldn’t necessarily assume that remains true if you’re reading this at some point in the future. 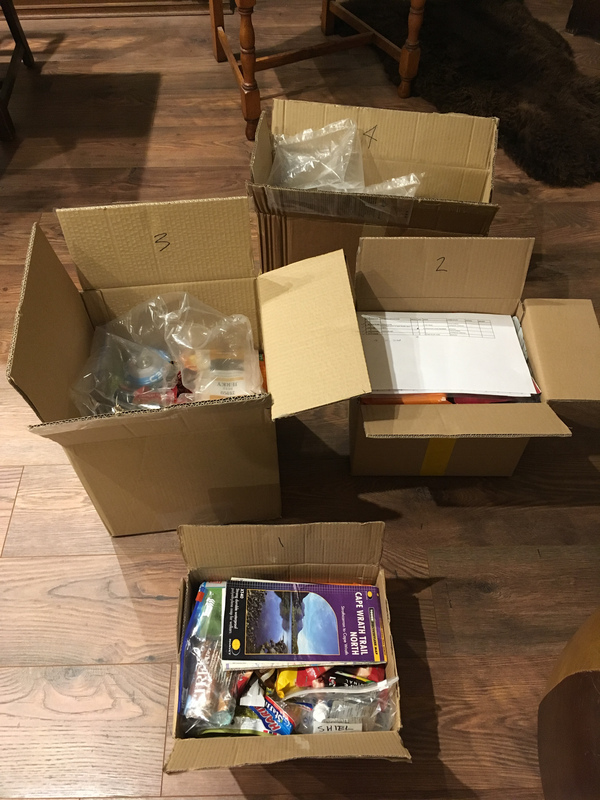 Most boxes also include toiletries of some kind (small toothpaste tubes, hand sanitiser etc). A couple of the boxes contain maps. Glenfinnan. I’m starting my walk from Ardnamurchan Point, so I’ll already have walked around 60 miles by the time I get to Glenfinnan. My brother James will join me at Glenfinnan with a resupply box containing six days’ worth of food to last me through Knoydart. Kintail Lodge Hotel, Shiel Bridge. Food for three days. Gerry’s Hostel, Craig. Food for five days. Forest Way Bunkhouse, Lael. Food for six days. I have the option to hitch up the road to Ullapool if I need anything else here, but I’d rather not if I can avoid it. Maryck B&B, Unapool. Food for three days. The hotel at Inchnadamph would have been my first choice – I’ve stayed there before – but everything at Inchnadamph is closed for the winter. I will be supplementing these resupply parcels with food from the village stores at Kinlochewe and Kinlochbervie. I also contacted the Rhiconich Hotel, who were happy to accept a resupply parcel, but I decided against it as it’s only about 16 miles away from Unapool. Gas canisters are on the list of dangerous items that can not be posted, Alex. I hope you haven’t put the idea into the heads of any of your readers. Hi David, this was an honest mistake – I genuinely had no idea gas couldn’t be sent through the post, having never done the whole resupply parcel thing on this scale before. Given the enormous list of things I had to do before setting off on the trail (and it was frankly a very stressful time) something was bound to slip through the net, and it looks like this was it. Needless to say, I won’t be mentioning sending gas through the post in my TGO features, and I’ve edited this piece accordingly. Hi Chris, see the message I’ve left to David above – this was very much an honest mistake, which I regret (I spent the first week panicking that my parcels wouldn’t be delivered). I’ve certainly learned my lesson!